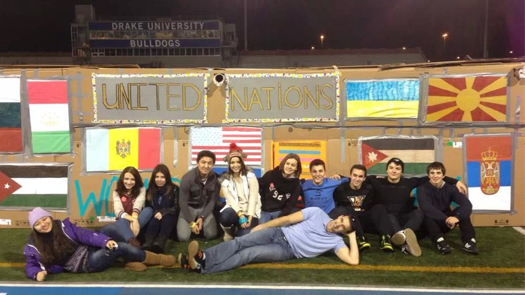 Vadym and other exchange participants built a truly international cardboard house to help raise money for the homeless in Iowa. From the moment that Vadym Bilous heard about the Future Leaders Exchange Program (FLEX) from his English teacher, he started dreaming of becoming a finalist. “When I won the second round, my teacher told me to imagine myself in a plane, flying to the USA, and a few months later I already was there. I was not afraid of leaving my home, my family, friends, and school for a year—my dreams had just come true,” he said of his acceptance into the FLEX Program, which supports high school-aged students ‎from 16 countries in Europe and Eurasia. Participants live with host families and attend high school for an academic year. Vadym soon landed in the state of Iowa and adjusted to a new lifestyle. One of the most memorable parts of the school year for Vadym involved volunteering within the community, which was one of the requirements of his program. In fact, he enjoyed volunteering so much that he more than tripled the required number of hours, performing more than 100 hours of service throughout the year. The biggest of the volunteer projects, which he carried out with other exchange students, was “Reggie’s Sleepout.” The sleepout raised money for homeless Iowan youth. As part of the project, participants had to raise $100 and construct a house out of cardboard and duct tape, then sleep in it for one night in a campus stadium. Vadym, together with his host mom, came up with an idea to build a house that would unite the exchange students, so they attached the flags of their home countries to it. The sleepout turned out to be even more fun and more interesting that the construction. Vadym met many new people, and he enjoyed the local concert. Vadym said his host family was fantastic, and they accepted him as their own son. In fact, now he said they are his second family. “FLEX completely changed my life. From a shy and fearful boy, I turned into a grown-up and self-confident young man, who could set up and reach goals,” he said. After he returned home, Vadym had to re-adjust to new life again, this time back in his home country. But the year spent in the United States gave him the know-how to deal with the situation and many more situations to come.